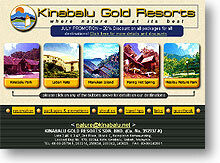 This is an initial web design proposal to a tourism company somewhere in Kota Kinabalu. The concept is a brochure-like web site with a reservation form that is then sent via e-mail to the company. After a while, the company decided to develop the site in-house. Tools & skills used: HTML, Adobe Photoshop, Microsoft FrontPage.